This is an emitter attracter particle system, very sensitive to the audio peak level. Note: Both DLL and PB source code are provided into the ZIP file, the new textures are inside the "Texture" folder, and they must be copied into the existing BassBox "Texture" folder, while the DLL must be copied into the BassBox "Plugin" folder. Best to see it in full screen mode. 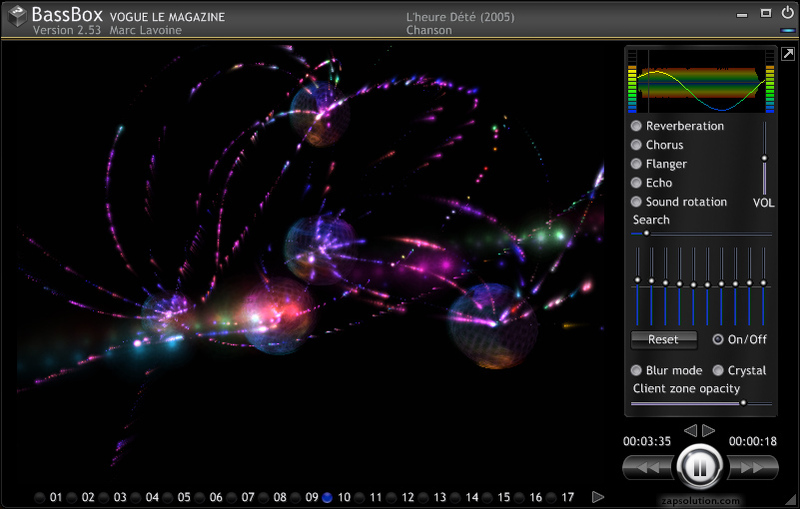 This one was based on the "StarGate" demoscene. Here is a reworked version of the Helios plugin. 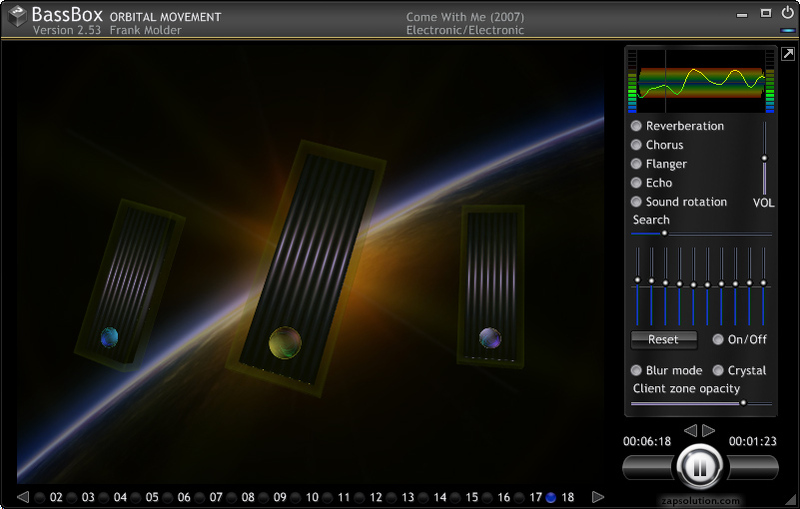 Spheres are replaced by quad surfaces, using billboarding to keep them always oriented in front of the moving camera. 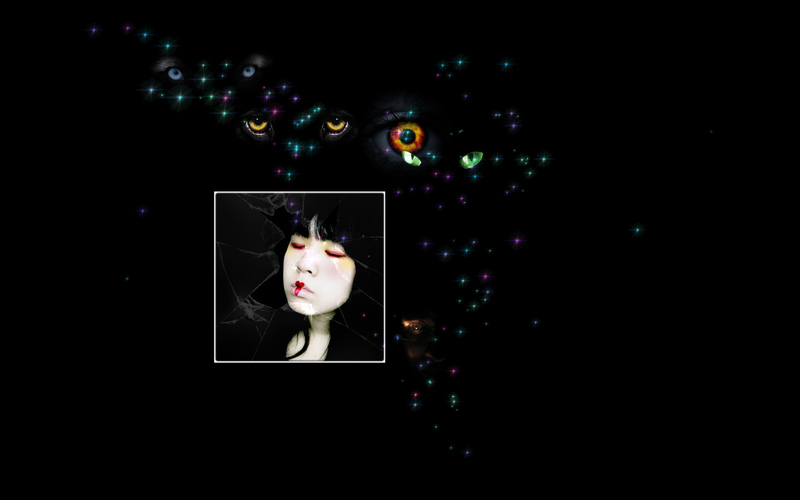 New dark grid background, using diffuse higlighting when the attracter quad surface become brighter. Tell me if you prefer this version or the previous one? The Asleep project has been converted into a new BassBox plugin. Note: Unzip the attached Asleep.zip into your BassBox directory, preserving the embedded folder tree structure. I encounter a problem using the BassBox "Matrix" plugin with it, that GPF after 20 to 30 seconds, never had such problemn with NVidia. Does anyone encounter the same problem running the "Matrix" plugin on ATI? Since it works for 20 seconds I would guess it is a badly handled buffer overflow in the ATI hardware. Are you accumulating any textures? Or maybe the chips are overheating It happened to one of mine once - an ATI Radion. So far i have no idea of what could be the cause, and "Matrix" is the only BassBox plugin which fails with this ATI chipset. Do you know of a good OpenGL debugger i could try? I did check with gDEBugger (that is now free) and i couldn't find any error, however i am unsure if i use this debugger correctly. Perhaps Petr has more experience with it, Petr? I will check it out. It is generally true that NVIDIA allows you to do some "stunts" beyond OpenGL specification, which may crash on ATi's which are very strict in their implementations. Version 6.14.10.10600 is version of driver, not of OpenGL as such. Looking at the number format, it seems to me like driver from 14th June 2010, maybe good idea to upgrade it. What do you get when you call glGetError on your PC? So far, i have checked glGetError with just a few functions. Please try to find after which command this happens - it is usually caused by not paired Push/Pop matrix calls, but that does not seem the case for Matrix plugin. I sadly can't get the error on my NVIDIA setup, so it is quite hard to catch. I did try to contact Jürgen Huhn who wrote most of the Matrix plugin, to see if he could have a clue, however he seems to have disappeared. I even leaved a message for him on "www.huhn-dialog.de", but no answer, i hope nothing wrong happened to him. I think i have found the problem, looks like the multiple calls to glFlush(), inside of the Matrix plugin, could cause a stack overflow with ATI. Doing it only once before wglMakeCurrent, seems quite enough. I consider this a problem worth reporting to ATi.